Sunset on Highland Lake, Goshen, Mass. In the beautiful hills of Goshen Massachusetts, visitors can find one of the most unique stops in the Hidden Hills of Western Mass. Three Sisters Sanctuary is an outdoor evolving art exhibit, park, and sacred space created by local artist Richard Richardson, in honor of his three daughters. Three Sisters Sanctuary is described on their website as, “healing gardens where art and nature merge”. Permanent installations include a butterfly garden, a bicycle arbor, wishing wheels, the Dance of Life labyrinth, and the amazing mosaic fire-breathing dragon. Also not to be missed, the giant Tin Man of Goshen outside the Good Time Stove Company. Three Sisters Sanctuary holds many seasonal events, including volunteer opportunities to contribute to the sanctuary art exhibits, live music, and best of all, lighting the dragon. Also in town, don’t miss a visit to the Daughters of the American Revolution State Forest, where you can climb to the 360-degree views atop the fire tower, enjoy miles of hiking trails and swim in what locals call the “Goshen Ocean”. 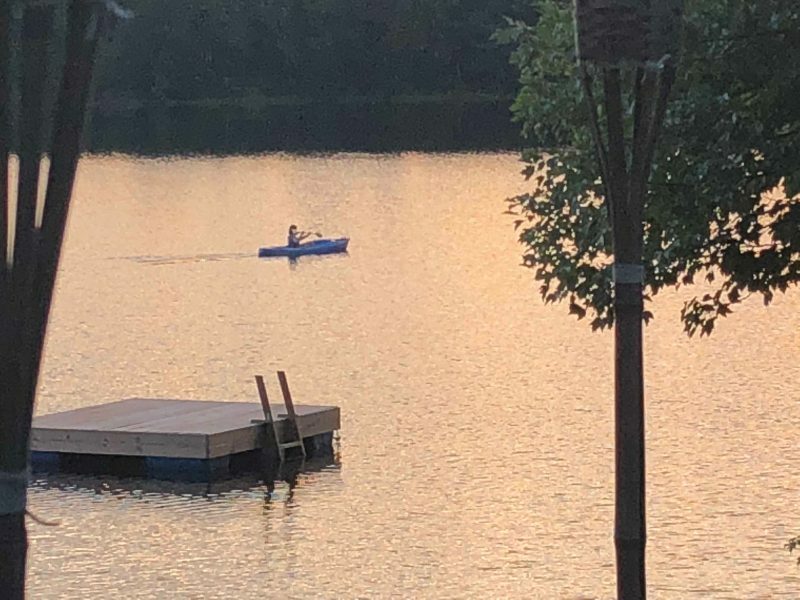 A kayaker on Highland Lake. 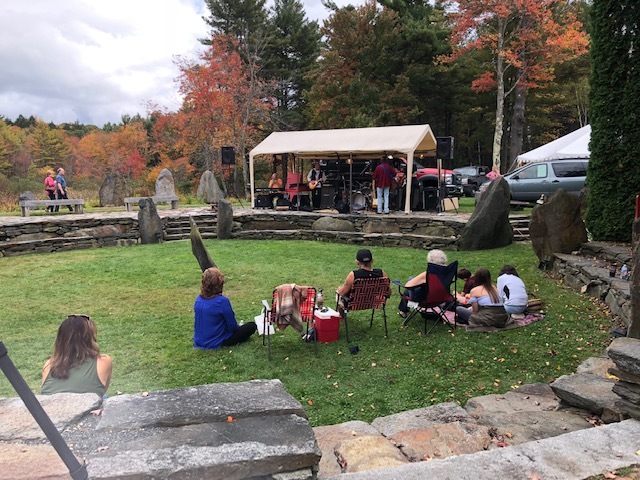 A Sunday concert in the stone theater of Three Sisters Sanctuary. There are two main lakes in Goshen, one better known at DAR and another just below this lake called Highland Lake. 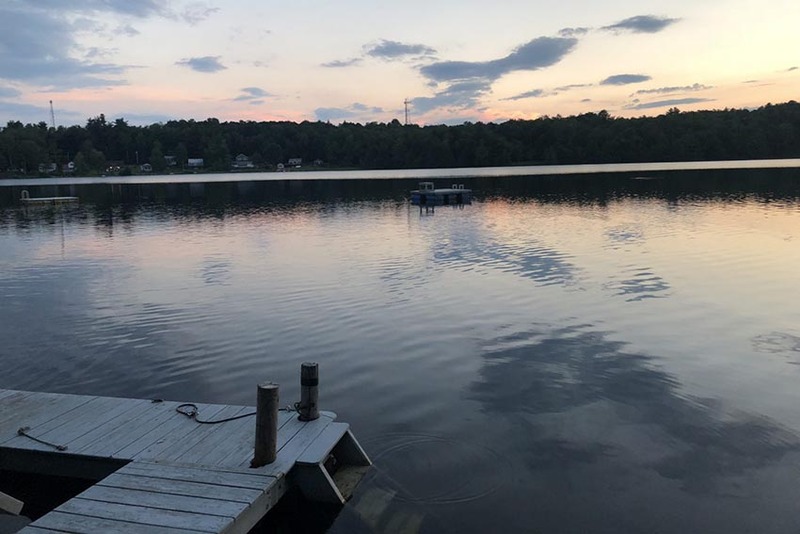 Many locals from Springfield and Northampton own cabins along Highland Lakes, seasonal retreats that offer private docks and a chance to truly relax!